From the tenth through thirteenth centuries, the demand for brownish-black glazed tea bowls increased tremendously as Fujianese tea and tea drinking customs spread throughout Chinese society. It is interesting to note that the major tea producing provinces of Fujian and Kiangsi each had important kiln districts specializing in the production of black ware. The introduction of Fujianese tea to the Northern Sung court (960-1127) brought with it a taste for the rich, lustrous, black-glazed stonewares from the Chien kilns. 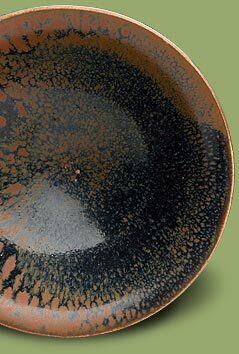 This ware was distinctive for its glaze effects known as "hare's-fur" and "oil-spot" that occurred naturally during firing. The Chi-chou kilns in Kiangsi were especially known for their tea bowls which featured a variety of stenciled, splashed, brushed, and resist techniques in their innovative glazes. Northern kilns including Ting and Tz'u-chou also produced black ware tea bowls for a large audience.